Do you like an easy weekend breakfast? I have to say this is a meal we really love. Make it for breakfast, make it for dinner – either way, works! 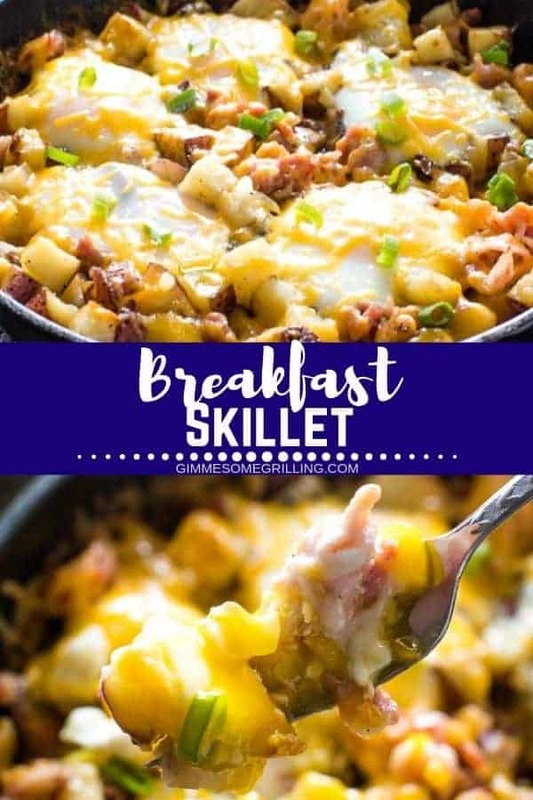 Especially if it’s this Breakfast Skillet made in my favorite cast iron skillet. 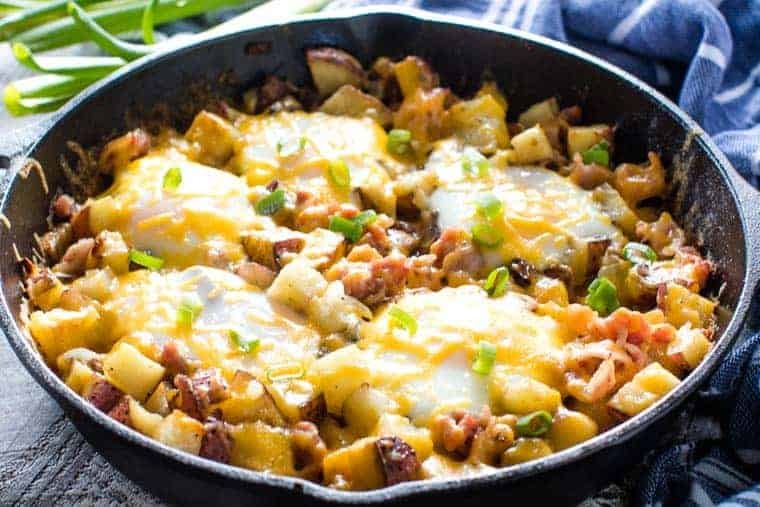 There’s something about that oozy egg over these deliciously grilled potatoes and bacon, it’s the perfect combination! I like adding a bit of Tabasco sauce, or hot sauce to top it off, mmmm!!!! Who doesn’t love the perfect runny egg?!!! I can’t even take credit for this recipe once again, I mean I could, but then I’d be lying. This was totally Jason’s creation. I mean it has bacon, eggs and potatoes. You know he’s behind it then. It’s like his ultimate love language. He’s the one that came up with this delicious Cheesy Bacon Burger with Fried Egg that was one of my FAVORITE burgers ever. Maybe he’s onto this whole “put an egg on everything” philosophy! 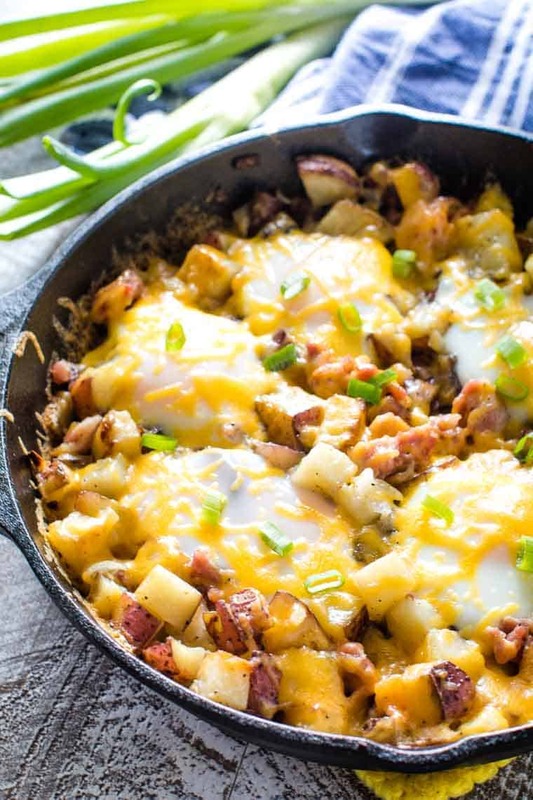 What do you put in a Cast Iron Breakfast Skillet? You can think of the list above as a starting point for your skillet meal. You can also add diced green peppers, sausage, diced onions, even jalapenos slices – doesn’t that sound delicious? If you’ve never owned a cast iron skillet, now’s the time to get one! They are inexpensive and a great tool for the kitchen. The first thing you’ll want to do is season the skillet. Why do you take this extra step? Properly “seasoning” the skillet will help build up a non-stick surface! Start by washing in soapy water and drying it with a towel. Spread a thin layer of oil all over the skillet. Place it upside down in a preheated 350-degree oven for one hour. Wipe off any excess oil when you are done and the skillet is ready to use! You made need to periodically season the skillet. When you do, follow the steps above. After cleaning be sure to always wipe it dry with a paper towel. This will prevent your skillet from rusting. 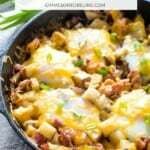 I love this breakfast recipe because it’s friendly for a hot morning when you don’t want to heat up the house, when you are camping or at the cabin too! 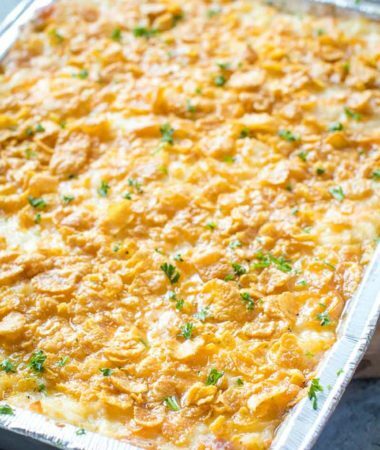 Personally, we were at the cabin when we created this recipe! Dice the potatoes and bacon, mince the garlic. 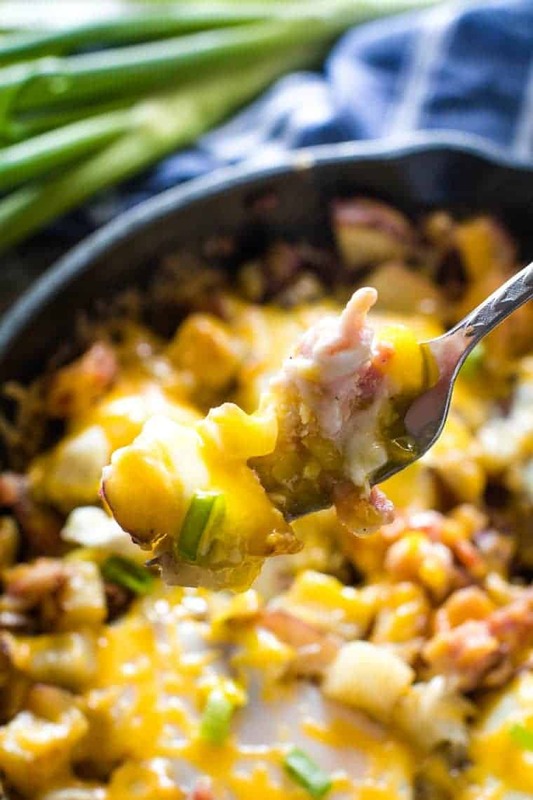 Mix together the potatoes and bacon – season. Place the skillet on the grill and melt the butter. Add the seasoned potatoes and bacon. Cooked until browned, stirring occasionally. Add the garlic during the last minute of cooking the potatoes. Next, make four wells in the potatoes. Crack an egg into each well. Continue to cook until the whites are set, about 10 minutes. Sprinkle with shredded cheese, melt and serve! 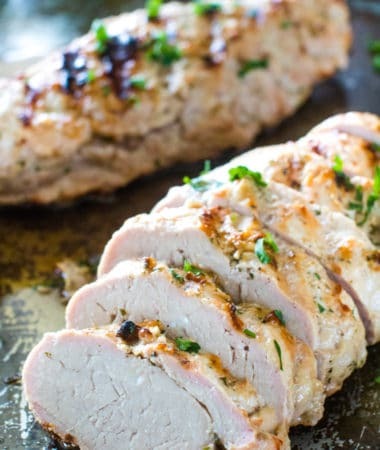 If you’re making this meal indoors, you’ll start by preheating the oven. From there, follow the steps above, except brown the eggs and bacon mixture on the stove top. When the potatoes are cooked, make the well and crack the eggs, then tuck it into the oven to finish cooking. More great breakfasts made right on the grill! Don’t forget, be sure and tag me on Instagram at @julieseatsandtreats or with #julieseatsandtreats – that way I get to see your terrific breakfast! 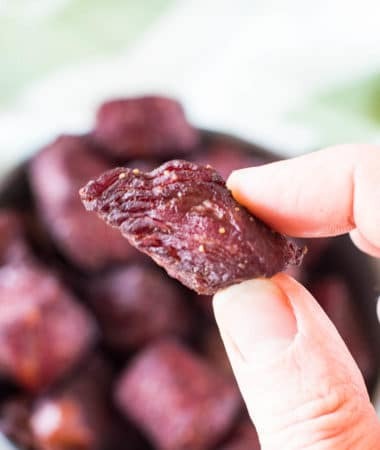 Comment below with a five-star rating, so I know you love this recipe!!! Place cast-iron skillet on grill. Heat butter in skillet. 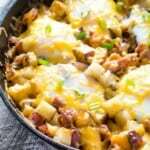 Add potato mixture and bacon to skillet; close grill lid and cook until brown and tender; stirring occasionally. Add garlic right before potatoes are done cooking and saute for about 1 minute. With back of spoon, make four wells in the potato mixture; break eggs into wells. Close grill lid and bake until egg whites are completely set and yolks begin to thicken but are not hard. This will take about 9-11 minutes. 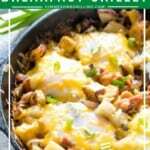 Open grill and sprinkle cheese on skillet. Close grill lid and let cheese melt for a few minutes. Place cast iron skillet on the stove top. Melt butter in pan. 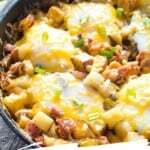 Add potato mixture and bacon to skillet. Cook until brown and tender; stirring occasionally. Add garlic with 1 minute left in cooking time. Remove from stove. Make wells in potatoes and break eggs into wells. 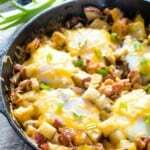 Place skillet in preheated oven and make until egg whites are completely set and yolks begin to thicken about 9-11 minutes. Remove from oven and sprinkle with cheese. Place back in oven for about 2 minutes or until cheese is melted. People are missing out if they don’t own a cast iron skillet! This breakfast looks amazing! Putting an egg on everything is a great idea 🙂 That burger you mentioned sounds incredible, too. Right! You can never go wrong with adding an egg! 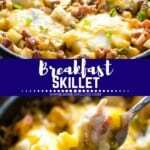 I live for breakfast skillets!! I could eat them for any meal!! I love breakfast for dinner so I’d take it anytime too!